The county was traditionally a center of industry, with paper and textile mills along the 170-mile Kennebec River. Augusta (pop. 19,136) is the county seat of Kennebec County and the capital of Maine. Augusta is the third-smallest state capital – after Montpelier, Vermont, and Pierre, South Dakota. The Maine State House was built in 1832. The University of Maine at Augusta, established in 1965, has about 5,000 students. The Moose is the school’s mascot. The Kennebec County Courthouse was built in 1830. 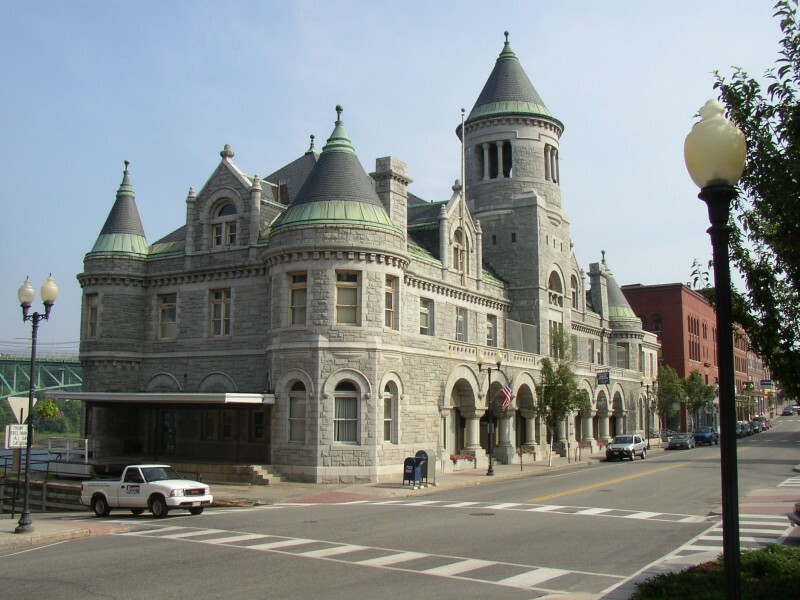 The “Olde Federal Building” in Augusta served as the city’s main post office until the 1960s. The Kennebec Arsenal is a historic district in Augusta dating from the 19th century; it has been empty and awaiting renovation for several years. The state housed mental patients there for many years. The city of Waterville (pop. 15,722) is the home of Colby College, a private liberal arts college that was founded in 1813. It has about 1,800 students. Waterville also has the “Two-Cent Bridge,” a suspension footbridge over the Kennebec River which formerly had a toll of two cents. It dates from 1903. The charge was abolished in 1960. The 25-foot Ladies Delight Lighthouse on Lake Cobbosseecontee has been preventing boats from running aground since 1908. Poet Edward Arlington Robinson grew up in the town of Gardiner (pop. now 5,800). This entry was posted in Maine and tagged Augusta, Colby College, Kennebec Arsenal, Kennebec County, Ladies Delight Lighthouse, Two-Cent Bridge. Not only enjoyed Maine, but this post inspired a nice e-stroll down memory lane with Simon & Garfunkel. Not only had I not heard Richard Cory before (my parent’s album didn’t have that song on it) but also didn’t know that Mrs. Robinson was originally a brief piece written about Mrs. Roosevelt and used in the movie The Graduate. The well known tune that was on my parent’s album, was written some time after the movie and became a big hit. It’s amazing that we can now see live performances of “old time” musicians with a click of the mouse on YouTube! And, get the story behind all the songs on Wikipedia!! How do the libraries stay open these days? Well….with our mandated tax dollars, of course, but that’s another subject….